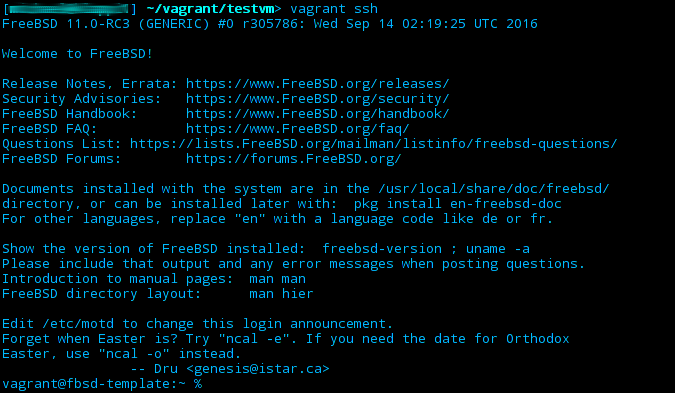 The previous post discussed what Vagrant is, explained the installation (on FreeBSD), detailed the process of creating a new VM and briefly described how to install FreeBSD 11. The next step is to prepare the fresh installation for Vagrant and eventually create an actual base box from it. If you’re new to VirtualBox or you don’t know what a provider is when it comes to Vagrant, you might want to read the first part. If you however already have a decent idea of virtualization and making sensible choices when installing FreeBSD, just do a fresh install in a VM and continue reading here. If you haven’t read the first part: These two posts weren’t written without cause. The idea was to dive into Bacula (a program for doing backups). For testing backups properly you need more than one machine obviously. I don’t have enough spare PCs, so using Virtual Machines seemed like a good way of working around that limitation. Since Vagrant makes working with these VMs really easy, it totally makes sense to use it. I’ve used it quite a bit in the past and while I was at it again, I decided to blog about this great tool so that you maybe consider adding it to your tool set as well. There are a few things on the side of the guest system that need to be in place so that Vagrant can work with it properly. The first step is optional but considered good practice if you intend to create a public base box: Disable unneeded resources! 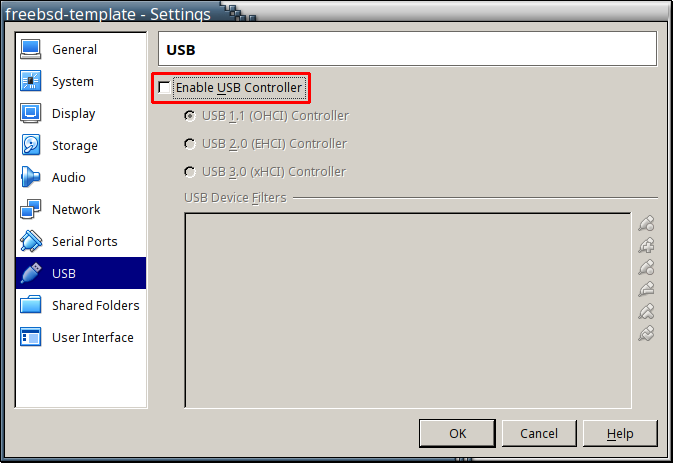 To do so, go to the settings of your VM template in the VirtualBox GUI. 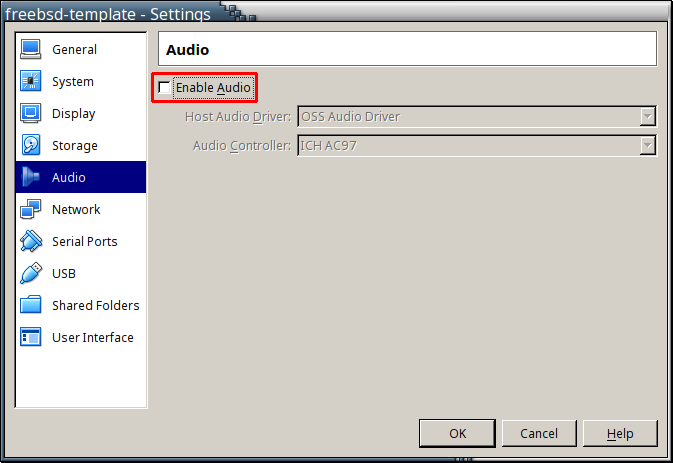 A good candidate to disable is audio support which is not generally needed in a Vagrant box. Also deactivate USB support. It’s enabled by default but is most likely unneeded in Vagrant boxes (there are other ways to share data between the VM and the host system). which will call a wrapper script that lets you edit the file and check it for validity before actually saving changes. Why’s that? Because on certain system configurations you can easily lock yourself out of the system with a defunct sudo (and you basically lose sudo when you ruin its configuration file)! Even though the script has vi in its name, that’s just the default. You may want to set the EDITOR environment variable to another editor if you prefer emacs/nano/joe/whatever. Not liking vi is NOT an excuse for not using visudo! When editing the sudoers file, look for the line %wheel ALL=(ALL) NOPASSWD: ALL. It’s commented out by default. Remove the comment sign and save. That’s actually all that needs to be changed. What that change does: It grants all members of the wheel group unrestricted sudo access without having to enter their password. Depending on what kind of base box you want to create, you may want to install the VirtualBox guest additions. They enable the hypervisor to directly interact with the guest system enabling some features like a shared clipboard, enhanced graphics options, shared folder support (which are not available on *BSD at the present time however), etc. The downside is that they are quite large (due to their dependencies): ca. 350 MB. If you’re aiming for a small base box, leave them out if you don’t need them. Otherwise consider installing them. This will make pw add a user with the name vagrant to the system, create a home directory for them, set the shell (you can also choose another one here like /usr/local/bin/bash for example) and make it use what is piped into it as the password (that’s a zero following the -h, btw.). It will also set the default login class for the user, use the provided user comment and add it to the wheel group (for which we’ve already configured sudo access). This downloads the vagrant.pub file as authorized_keys (the file that SSH checks against) and skips verifying the SSL certificate of the remote web server (this is necessary because FreeBSD does not ship with a collection of trusted root certificates and we haven’t installed one). With the key in place we have everything that’s required for a simple FreeBSD 11 base box. I usually deactivate NLS (support for non-English translations), IPv6, DOCS and EXAMPLES for all programs. You may choose different options of course. Deselect postgresql and select sqlite instead! When you accept the settings, you will be asked to select the settings for postgresql next. This is because the list of ports to configure was compiled before you changed the dependencies by choosing to build with support for another database. Hit CTRL+C to cancel the operation and then run make config-recursive again. Just like before, leave out unneeded options to keep the whole system a little lighter. Leave sqlite3 as-is if you don’t know too much about it (it’s a port with A LOT of options and can look rather daunting). Remove the distfiles (/usr/ports/distfiles) if you don’t require them to be available later; if you need some of them, delete the others! If you chose to use multiple filesystems, you may want to dd to a ZERO file on each separate filesystem (e.g. /usr/ZERO, /var/ZERO, etc.). 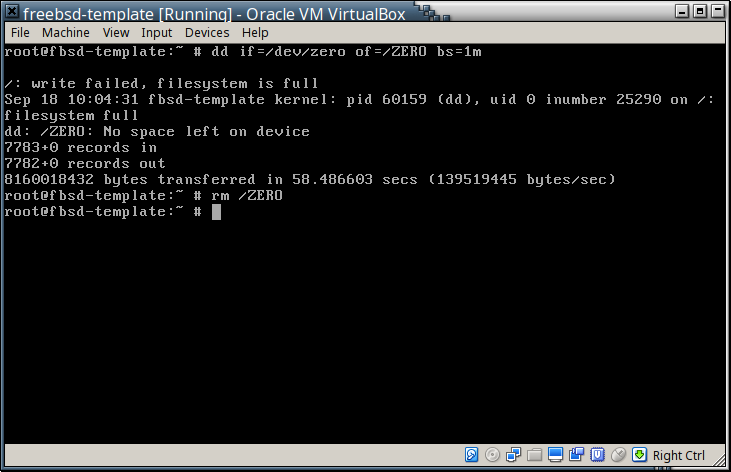 The argument after –base is the name of the VM as it appears in VirtualBox. Mind upper and lower case! Choose any name for the output file (the extension is usually .box). This will take a moment but if all goes well you should eventually have the base box file! Base box created and added! again, you should see that it’s available now. What’s left? Let’s test if it actually works. This creates a default Vagrantfile. Think of this as the central configuration for a single VM that Vagrant manages. It contains the name of the base box to create it from, allows configuring of the network, synced folders, overriding base box settings (like the amount of RAM for the VM), provisioning, etc. Substitute fbsd-template with the name of your base box if you chose a different one. The second configuration directive disables synced folders: They don’t work for *BSD guests at the present time and Vagrant would issue an unnecessary warning if we didn’t disable it. This is all you need for a very basic configuration. Save the file and exit your editor. This command tells Vagrant to create a new VM from the base box (VM template) selected in the Vagrantfile and fire it up. Vagrant will do so in the background – it runs the VM in so-called headless mode. 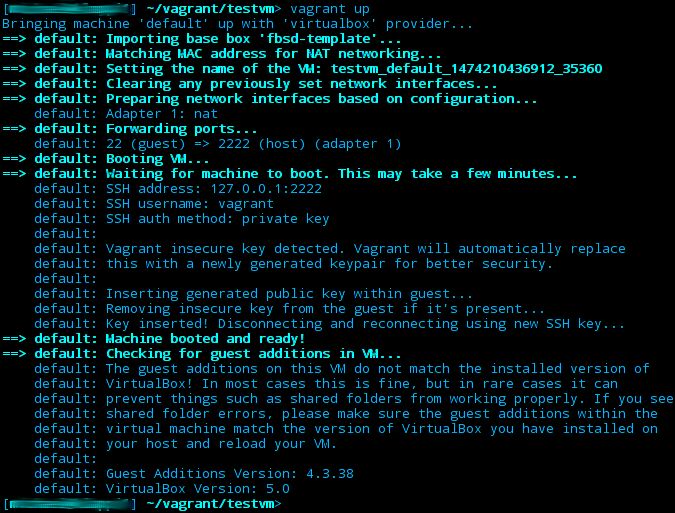 You don’t need the VirtualBox GUI for Vagrant but right now take a look. 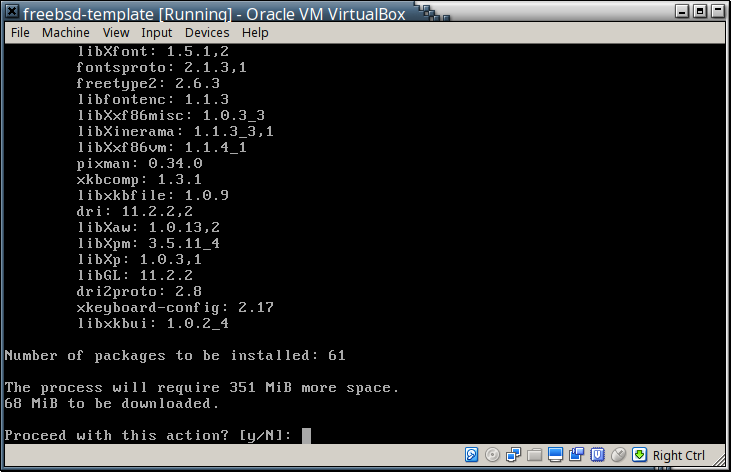 You’ll see a new VM that was created by Vagrant and in fact you could also use VirtualBox to control it. But that’s rarely necessary. 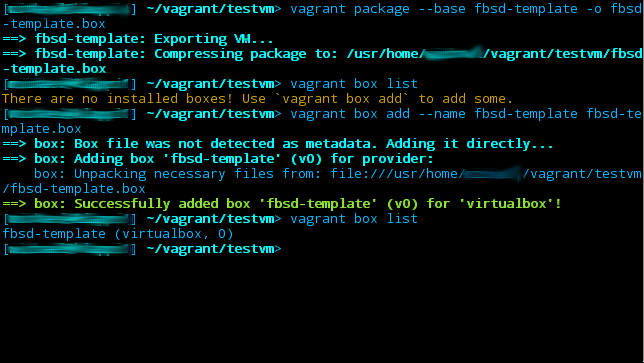 Vagrant is meant to manage boxes all for you after all! Now you’re SSH’ed into the VM! It’s as easy as that. Issue an ls or something to see that it’s working. Exit the machine by logging out (type exit or press CTRL-D) and you’re back in your host machine’s VM directory. Try vagrant ssh again and you see that you’re inside the VM again. This will purge the VM. If you keep the Vagrantfile, you can just vagrant up afterwards to start over with a clean VM (from the base box) again. This is great for testing things. You can also control the VM from outside using commands like vagrant halt, vagrant suspend, vagrant resume, etc. I suggest you take a look yourself and learn what Vagrant can do for you. It really has some neat and useful features. later we’re done with cleaning up after ourselves. The base box works and can be used to quickly spin up VMs based off of it. While this is neat, the real power Vagrant has and the real comfort it provides show when you’re working with several VMs at the same time. Which is what I intend to do in the post after the next one. 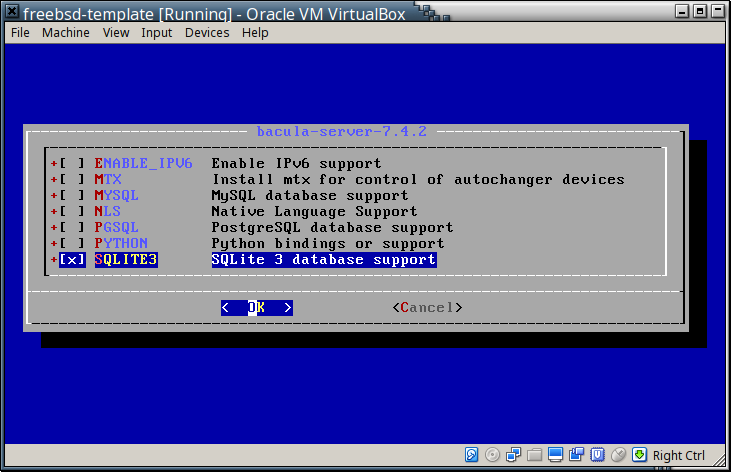 The next post will be an introduction to the Bacula backup software, exploring the basic functionality.